In a world that is not predictable, improvisation, evolution, and innovation are more than a luxury: they are a necessity. The challenge of design is not a matter of getting rid of the emergent, but rather of including it and making it an opportunity for more creative and more adequate solutions to problems. Meta-design is an emerging conceptual framework aimed at defining and creating social and technical infrastructures in which new forms of collaborative design can take place. 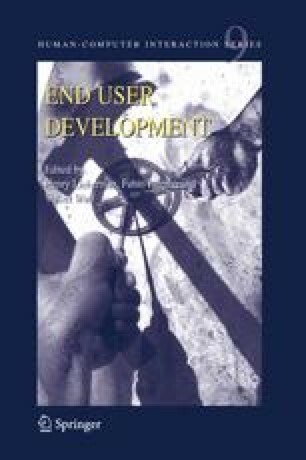 It extends the traditional notion of system design beyond the original development of a system to include a coadaptive process between users and a system, inwhich the users become co-developers or co-designers. It is grounded in the basic assumption that future uses and problems cannot be completely anticipated at design time, when a system is developed. Users, at use time, will discover mismatches between their needs and the support that an existing system can provide for them. These mismatches will lead to breakdowns that serve as potential sources of new insights, new knowledge, and new understanding. This chapter is structured in four parts: conceptual framework, environments, applications, and findings and challenges. Along the structure of the chapter, we discuss and explore the following essential components of meta-design, providing requirements, guidelines, and models for the future of end-user development: (1) the relationship of meta-design to other design methodologies; (2) the Seeding, Evolutionary Growth, Reseeding Model, a process model for large evolving design artifacts; (3) the characteristics of unself-conscious cultures of design, their strengths and their weaknesses, and the necessity for owners of problems to be empowered to engage in end-user development; (4) the possibilities created by meta-design to bring co-creation alive; and (5) the need for an integrated design space that brings together a technical infrastructure that is evolvable, for the design of learning environments and work organizations that allow end-users to become active contributors, and for the design of relational settings in which users can relate, find motivations and rewards, and accumulate social capital. Key words. co-creation, design for change, design space, design time, domain-oriented design environments, Envisionment and Discovery Collaboratory, interactive art, open systems, SER model, social capital, underdesign, unself-conscious cultures of design, use time, value-feelings.